Curl via Scott McKay's Switch Curling for one or two players - be sure to check out the rest of Scott McKay's collection as well! This site is a fun interactive drum set. Use it on your interactive keyboard or with a touchscreen as a cause and effect or music making activity. Click "show key hints" and set switches to those keys using your switch interface or JoytoKey or us a customizable like Intellikeys with an overlay. You can also set a switch to to tab/enter or to tab plus various arrow keys for access. (The only problem with that is that the stool links to a pop-up.) Link from Garachico Enclave. Twinkl is a site of wonderful free resources along the lines of Mrs. Pancake. It is still very much under development, but every time I check back there is something new. The resources come into the categories of literacy, numeracy, themes, signs and labels and management and behavior. Under Management and Behavior it looks like they have saved a space for SEN and PSHE (special educational needs and personal safety and health education). I can't wait to see what they add there. Perhaps you have a wonderful children's story you want to write starring a child with multiple disabilities, perhaps you have a social story you want yo try in a new format or perhaps you want to write a story to go with a theme unit you are teaching. Maybe you want your students to write a story. Here are three sites designed for creating children's books. Story Jumper has an option for a classroom account on the sign-up page which gives you a free account and some other special features, so be sure to use it. In the classroom account you can add students and give them home access to books you create. The pages of the books can be turned via switch, given the arrow is over the turn page button and the switch is set to click. Right now there are quite a few fables you can explore for free in Story Jumper in addition to making your own book. When creating a book there is "story from scratch" or any of nine templates to use. For example the calendar template might be fun to customize to your class or a particular student, perhaps using pictures from the school year, and then use to reinforce calendar concepts. Creating and editing the books using Story Jumper is pretty simple. Story Something is another children's story site, but is designed for families. Also it doesn't allow authoring, but rather personalizing. Sometimes, however, some of the best resources for our family-like substantially separate classrooms are homeschool resources. Story Something is in beta testing so there is a chance it will charge in the future. Story Something has many stories in different topics from holidays to science and it allows you to personalize the stories by changing the characters names. You can print or e-mail the personalized stories. I have written about story bird before. Since then they have freshened the interface and added even more great art. It is a great tool that allows you to find art and then compose text to create a storybook. You can work solo or collaborate. The books do not read aloud, but can have the pages turned with a switch set over the turn page arrow and when reading a book the computer goes to full screen mode. While still in beta mode, Story Bird commented last time I wrote that they will always be free. Tikatok asks students (or their teachers) to write on themes using Story Sparks (aka story starters). Then this writing and the uploaded drawings (no pre-draw art or images here) are turned into a book to access on the site or to have printed as a "book store quality book". There is a special section for teachers with recommendations on how to use the site and special pricing. Note that you are required to sign off on getting parental permission. Bookemon allows you to create books using a template or a document like a Power Point or PDF. There a many templates from stories to year books. You can use uploaded images, photos and art work or the provided art. Once your book is created you can keep it online or have it printed as an actual book for a fee. There are two options for teachers; educator discounts and ed centers (private groups for your students). Labels: online story writing, story. Dynavox, PRC and Tobii ATI are now processing Mount N'Movers as part of their funding resources. Several users I know have received new AAC devices in the past several years since the Mount N'Mover has been on the market, but the funding process required we go with Deassy or CJT mounts (perfectly respectable and wonderful systems) even if the user could really benefit from the ease of use and increased independence of a Mount N'Mover. I even knew one power chair user who could have moved his own device aside with the Mount N'Mover to do chores like laundry or to use the transfer board to assist in moving in and out of his wheelchair. It is thrilling to now have the Mount N'Mover as an option. It might also be just the thing for eye gaze device users with lots of forward/backward movements to accommodate within a wheelchair. New options are always exciting in a limited market. Don't Be a Language Stealer! model, model, model use the devices and symbols around the room to convey messages; if you are helping a student link to the page they need verbalize what you are doing, i.e., "I am going back the the main page and then to your people page, now you can activate the "friends" button." Do this even when changing overlays for mid-tech devices as mid-tech users may/will become high tech users and need to understand why you change layers, i.e. "Cooking is over, so I am taking out your cooking core vocabulary board and putting in your social core vocabulary board." Make sure to send it home... all of this needs to happen at home too! Tico is a free, open source symbol (or text) based dynamic display AAC program for the Windows operating system. The Tico Application is part of the collaborative project between the Department of Computer and Systems Engineering from the Higher Polytechnic Center of the University of Zaragoza and Public School Special Education Alborada. Tico's software and hardware for individuals with physical and or cognitive disabilities. Tico is able to be used in the "Interpreter" mode (think Boardmaker use mode) by direct selection (via touch screen, mouse, head or eye tracker) or by scanning (which is built into the software). Tico uses the full ARASAAC symbol set, a free, open source symbol set anyone can download. January 15, 2010 the ARASAAC Web Portal went live in English and is attempting to be a free, world wide resource for AAC. To use the ARASAAC symbol set with Tico you should download it from the link on the Tico page and follow the (easy and intuitive) instructions to set them up. 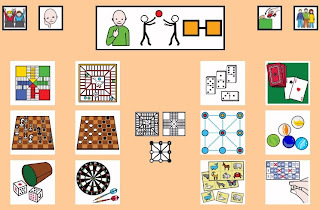 I was also able to import Mayer-Johnson Picture Communication Symbols from the Metafiles bundles, Inclusive TLC clip art, Widgit symbols, the free Mulberry symbols, jpg photos and SymbolStix from the SymbolStix Online Website into Tico without any problems. Although originally designed in Spanish Tico (and ARASAAC) work fine in English. Some support materials are not in English yet, but thus far I have not found a need to reference them or have been able to use on line tools like Google Translate or BabelFish to assist me. As promised here are some stories of our first week with the Tobii P10 in our classroom. Thus, as you can read, our user is phenomanal (I like the term "rock star"). The Tobii is also pretty cool. The eye gaze is quite amazing. We have super accuracy when the user is in her stander. Our user also likes to move around a lot, especially forward and back in her chair and the Tobii works fine. We did have some issues with our user having trouble accessing the top row of the Tobii while in her wheelchair. After days of this the only thing that worked to fix it was adjusting her headrest. Logically adjusting the Tobii should have worked, but it turned out the user really needed more room to move her head back. Battery life is another small problem we are having. This will not be an issue on the Tobii C-eye which has hot swap batteries, but the P10 has a 13 pound "portable" (depending on your definition of portable) which makes it not quite six hours. Sadly the school day is six hours. So there is some time when our user is without communication. There are also three bugs (so far) that we are having with the software. The first is that sometimes the eye tracking will be working fine in the "Tobii Desktop" but not in the "Communicator" software. Meaning we have to shut down Communicator and re-open it. Annoying but no big deal. A bigger deal is that for some reason when we attempt to import some files we get a "Out of Memory" message on the Tobii. This when there is some 26+ Gigs of memory available. This can be problematic when we have put a lot of effort into making something and it can't be imported. Tech support has had no answers for us. Finally there has been an issue with the fact that there are multiple places in Communicator to make buttons do the same thing. Thus it is possible to "send mixed messages". So if in one of the places you tell a button to do the action "go back" and in another you tell it to "go to page named MAIN" then the button will not work. Annoying. Tobii should fix that. That being said, excepting those bugs, Communicator is 100 times easier to program than any other communication software I have ever used (and I have used Boardmaker SDP, Dynavox 2c-V, Chat-PC, Enkidu, Talking Box, Gus, Tango, Word+ and more). So don't get the wrong idea. However, Tobii is sorely lacking a sharing community for Communicator. They really need to get on this! Granted Tango and Dynavox, among others are lacking in this area, but Boardmaker really shines and Communicator could really be something is sharing was happening! Also they should get some books into the Accessible Book Collection in Communictor (.cdd) format. Que Vuelen Las Mariposas (The Butterflies Flying) is a cause and effect game for touchscreens, interactive whiteboards, the mouse, head or eye trackers. The butterflies also fly away one by one and return if a switch is set to "tab". Touch a butterfly and it flies away (and then flies back). Teacher directed you could work on colors via the site. The link comes from Juegos Atención Temprana. Alternate Format Books and Stories has been updated to include many more links, including Signed Stories a great site to check out. The Full Disclousure PermaPost has been updated as well. NRL is also found in many adhesives like glues and tapes. Cling design packaging, like that for band-aids may contain latex. Many mobility aids, such as wheelchairs contain latex (in the tires and the cushions especially). Also some toys, such as Koosh balls, have latex. 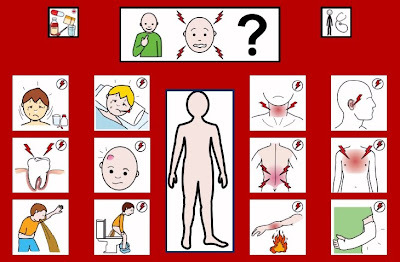 Latex Allergy Resources is an excellent place to turn for information. The ALERT Foundation has an excellent list of latex free products with phone numbers. Teachers, nurses and caregivers should also be aware that related allergies include bananas, avocados, chestnut, kiwi, pears, poinsetta and milkweed pods. Thus in those with severe allergy to latex these should be avoided. If you run a latex free classroom there are signs you can print out at Latex Allergy Links for your room door. Today was the first day of a 4 week trial rental of a Tobii P10 eye gaze communication device for a student in my class. This has been a long time in coming for this student. There have been many sessions with every maker of every brand of eye gaze AAC device on the marker. There has been some pretty intensive low tech intervention around eye gaze along with ongoing discussions, data collection and educational planning. There were web based trainings, practice with the evaluations software and two face-to-face introductory trainings with our local Tobii rep Chris (who is spectacular). Time was spent showing the student the software and pre-training on the symbol set and the different lay-outs. All of it lead up to today. The Tobii came off the bus after a weekend at home and I was accused of looking like a roadie rolling it inside. The case is nothing to be scoffed at, the P10 is a ginormous device when you include the device, keyboard, mouse and mount, not to mention the battery. Shortly after, perhaps immediately after the tiral rental my student will purchase the light and portable Tobii C-eye, but perhaps due to its onerous size the P10 has a shorter waiting list to rent. Our SLP and I had discussed the best plan for laying out a starter board set for our student and I had received it that morning so I pop-ed in the flashdrive and installed it into the P10. It was a breeze to get it up and running. We had one stumbling block, somehow a setting had been changed in the input menu, but we quickly changed it back and we were off and running. The new user was in front of the P10 for four hours today, with some 75+ activations. Many of those were just explorations. However most questions were answered appropriately (i.e. "Do you want to taste some cheesecake?" P10 "Yummy!") and many comments were witty and said with a grin. Stay tuned for more on our adventures with the Tobii P10.